Matt Barnes (pictured) looked sharper than in his last outing, lasting five innings, allowing two earned runs on six hits. 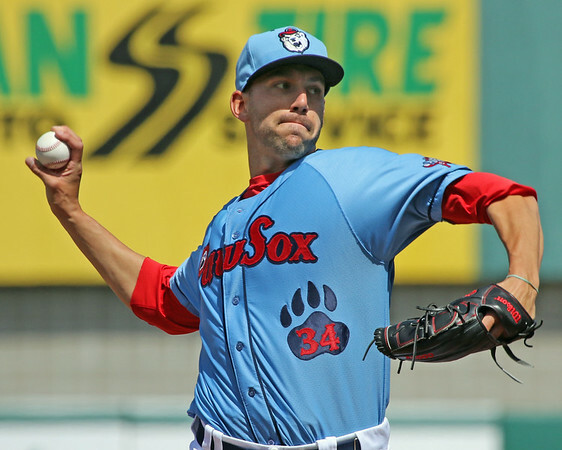 The PawSox got strong relief performances out of Dana Eveland, who wents two innings and allowed one hit, and Tommy Layne who secured his second save of the season with an inning of no-hit ball. Starter William Cuevas struggled with command, walking four batters in his three innings of work, giving up five runs on four hits, all in the third inning. Only 38 of Cuevas's 71 pitches were strikes, a 54 percent strike percentage. The damage was done by the time Cuevas left the game, but the Sea Dogs bullpen was lights-out. Jonathan Aro tossed three scoreless innings permitting just two hits, while Dayan Diaz closed things out with two spotless frames. Jantzen Witte drove in the Sea Dogs' only run with a two-out single in the fifth. Witte went 2 for 5 with a couple of strikeouts on the day. Right fielder Jonathan Roof reached base three times without the benefit of a hit, drawing three free passes. Sunday's contest between the Red Sox and the Mudcats in Salem was postponed due to rain. The two will make up the game on May 9th at 5pm as part of a doubleheader. The game between the Drive and the Tourists was also postponed due to rain, and will be made up at a later date that is yet to be announced. Player of the Day: Not much went right for the any of the teams on Sunday, but Matt Barnes's start was a step in the right direction after his shaky start to the season. Barnes didn't walk a single batter on Sunday and threw strikes, including 16 of 22 first-pitch strikes. The 24-year-old is on his second trip through the International League, after pitching himself to a 3.95 ERA across 127 2/3 innings at the level in 2014. Despite being a starter almost exclusively in the minor leagues, the 2011 first-round draft pick made his major league debut as a reliever in 2014, appearing in five games out of the bullpen.